Welcome to another July, 2014 issue of GL Communications' Newsletter providing information and insight into our enhanced Protocol Simulation and Conformance Test Tool referred to as Message Automation & Protocol Simulation (MAPS™) platform. 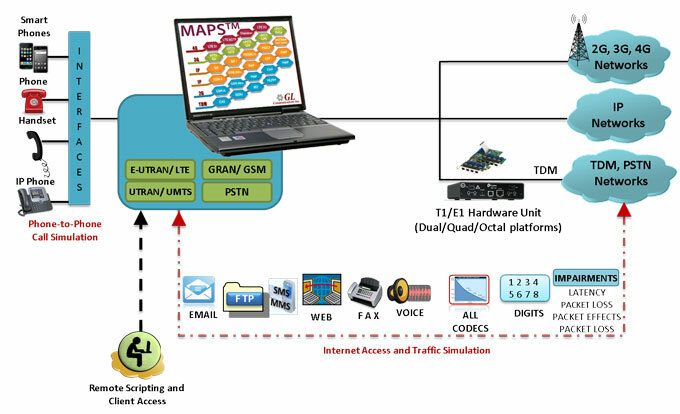 GL's Message Automation & Protocol Simulation (MAPS™) is a protocol simulation and conformance test tool that supports a variety of Wireless, IP, and TDM protocols such as SIP, MEGACO, MGCP, SS7, ISDN, GSM, MAP, CAS, LTE, UMTS, SS7 SIGTRAN, ISDN SIGTRAN, SIP I, GSM AoIP, Diameter and many others. MAPS™ tool covers solutions for both protocol simulation and protocol analysis. The application includes various test plans and test cases to support the testing of real-time entities. Along with automation capability, the application gives users the unlimited ability to edit messages and control scenarios (message sequences). "Message sequences" are generated through scripts. 64-bit Operating System Support - MAPS™ platform has been enhanced to run as a true 64-bit application (this support covers IP, 2G, 3G and 4G protocols and excludes TDM protocols for now). The 64-bit version is introduced to enhance the signaling simulation performance to overcome the limitation of only 2 GB application memory in 32-bit processors. Scheduler - Newly introduced scheduler feature helps user to automate the testing process. User can schedule the Load Generation, Call Generation and Call Reception at a specific start time. It uses the Master Configurations which contains pre-saved Test bed, Call Generation, and Load Generation configurations. Scheduler automatically loads the defined Master Configuration and executes the tests at scheduled time and duration. Send to DB: Test results such as Total Number of Calls Placed, No Failed calls, No Passed Calls, CPS, Memory utilized etc are accessible to scripts and are sent to database and can be accessed via web interface. This allows user to monitor and analyze test from remote places. User can also customize the results. Report Logging: User can generate and log customized reports directly from within the scripts for Error Events, Captured Errors, Call flow in PDF Format. Multi-Interface Support: New style of Call Control scripting is introduced, which includes parent and child scripts along with sub scripts to handle complete call control procedures and traffic simulation. The call control scripting allows controlling multiple protocols independently, and makes multi-interface simulation easy. Randomized Call Timers are introduced by which Call & Inter Call Duration can be randomized using various statistical distributions such as Normal, Uniform etc. Dynamic IP/IP Spoofing process helps in adding or creating IP address to generate each call with different IP address from a single system which gives multihoming capability. Multi-Core Processor Support: User can achieve improved performance by enabling multi-core processing. Each core initializes a protocol engine and contributes in enhancing the performance. For example, in MAPS™ SIP, user can generate signaling procedures at 250 CPS and 12000 simultaneous calls with single core and 1300 CPS and 70000 simultaneous calls with 6 cores. Link Status Detection - Scripts are enhanced to detect MTP and SCTP link status. On Link Down status all running scripts will stop and no new scripts will be executed. End-User Configurations - Signaling profiles have been updated with Enable Traffic option which provides the user to select specific traffic profiles like IVR, User-defined, Auto-Traffic File, Auto-Traffic Digits, Auto-Traffic Tones, and Codec options. The auto traffic profiles handle traffic automatically over established calls and the user-defined traffic profiles needs user intervention to initiate the traffic over established calls. IVR Traffic: User can select IVR traffic (Only TxRx digit) to validate voice path during load generation. User defined Traffic: User can select any of the traffic manually once call is established. Record file names can be configured to have Sequential, Random or Date and Time format. Tx File is automatically selected from the Voice Files directory based on Codec negotiated. Message Statistics: Number of Tx and Rx Message Counts are displayed in the Statistics View. Call Statistics: Statistics displays tabs for each call graph charts with 50:50 ratio with respect to window size. By default the statistics windows is set to display a PIE chart which can be refreshed every second. GTP Traffic Simulation is supported with Mobile Traffic core. Media Gateway node of MAPS™ Megaco now makes use of Voice Gateway (part of T1 E1 analyzer) to convert TDM traffic to RTP and vice versa. For comprehensive information on the product, please visit Message Automation & Protocol Simulation (MAPS™) web page.